Our favorite fall date-night dinner. 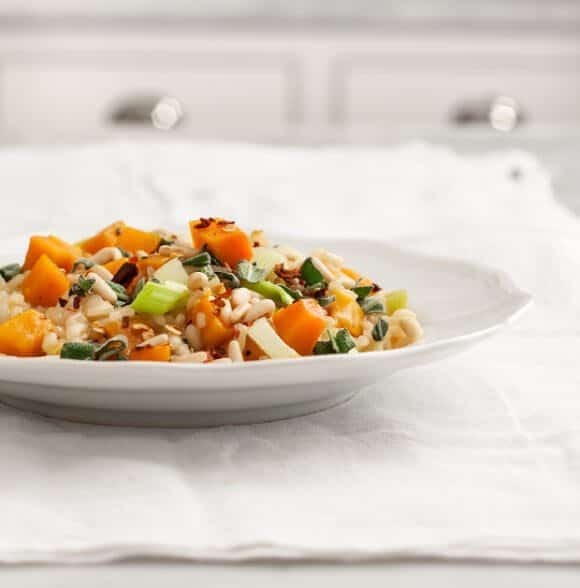 This herb, squash, and leek-filled risotto is a great healthy option for the holidays. Gluten free, vegan option. A few years ago, Jack and I spent Thanksgiving alone, just the two of us. We had always traveled throughout the holiday season, exhaustingly flying around to visit both families. But this one particular year we decided enough was enough, and we made the bold move to stay home. To buck tradition even further, there was no turkey, no trimmings… instead we made this butternut squash risotto and Jack’s signature seared scallops. “Thanksgiving Risotto” might not have caught on as an annual tradition, but it was delicious and made for a memorable night. That and the half bottle of wine that I spilled on the wall. I’m not exactly sure how it happened, but I knocked over a just-opened bottle of red wine… then I somehow caught it quickly enough for it not to spill on the floor but to leave a big spatter mark on the wall. First, start your butternut squash: Heat the oil in a medium skillet over medium heat. Add the butternut squash cubes and a few pinches of salt and pepper. Cook until they start to brown, gently flipping, to get color on the other sides, about 5 minutes. Before they start to brown too much, add the veggie broth and stir. Reduce heat to low. Cook until they are tender and cooked through, approximately 20 minutes. If the broth cooks down before they are done, add some more (or some water) to keep them from burning. 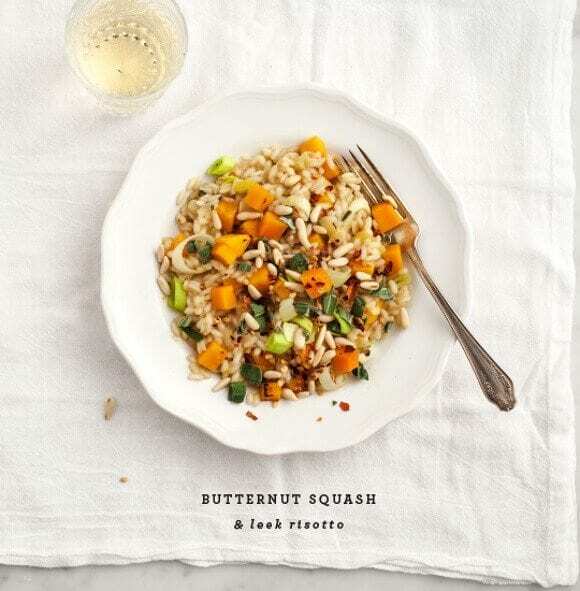 When the squash is at least half done, start your risotto: Heat the oil in a large skillet over medium heat. Add the onion, half the leeks, and a bit of salt and pepper. Cook until the onion is translucent but not browning, about 6 minutes. Add the garlic, stir, and cook for about 2 more minutes. Add the rice and mix it together with the onions so the dry rice toasts a little bit, about 1 minute. Add the wine, scrape up anything that’s sticking to the pan, and let the wine simmer down for another minute. Add the broth 1 ladle at a time, stirring continuously. Each time the liquid cooks down, add another ladle full. Before you add the last ladle of broth, add the cooked butternut squash, the remainder of the leeks, a pat of butter, sage, rosemary, and grated cheese. Stir to combine. Taste and adjust seasonings. Serve immediately. Top with pine nuts, if desired, and a pinch of red pepper flakes. 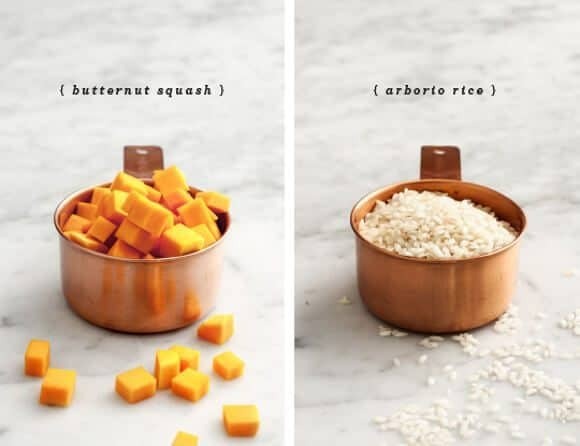 Alternatively, you can add your butternut squash cubes to your risotto pan right after the onions. As you cook your risotto they will melt apart into the risotto rather than remain cube shaped. Both ways are equally delicious. 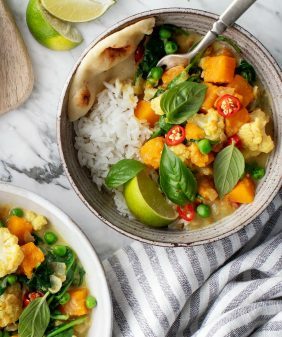 This rice dish looks fabulous! What an awesome, healthy idea! I’ve been craving a Love and Lemons meal lately. I need to make this soon! This is pretty much all of my favourite things in one bowl. This looks delicious!! Just wondering, how many people does it serve? Red wine on the wall, floor, or cabinets definitely is the sign of a good night! I like the pine nuts in this, the perfect little crunch! I may love my turkey and cranberry sauce, but this risotto sure sounds good! 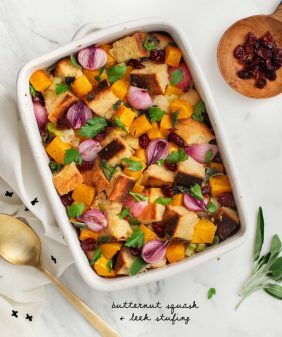 What a beautiful dish, so perfect for a Thanksgiving-for-two! I love the addition of the pine nuts & hard cheese. 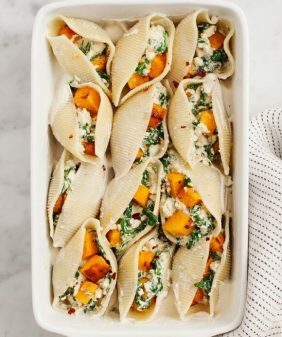 I imagine this dish tasting like the epitome of Autumn– I can’t wait to make it myself. THIS is what I’ve always wanted for Thanksgiving. Really. Obviously I am catching up on favorite blogs tonight. 🙂 Another winner, looks wonderful! This dish is delicious! My husband keeps nibbling from the pot and asking me repeatedly, “What’s in this?” I’m serving it with salmon. Can’t wait for dinner. Gorgeous! I think this will be one of my side dishes for the upcoming vegetarian christmas dinner I’m hosting for me family. Looks delicious! Thanks so much for this beautiful recipe! I made it last night and it was so good. Just wondered where the garlic should go in. I got to the end of the recipe and realized it was still sitting on my counter, never saw it in the instructions. I’m thinking maybe with the onion before the risotto is started? Would love your thoughts, then I can add that note and file this one away as a “keeper”! I’m going to go fix that in my instructions, oops! Yes, I put it in the pot with the onion (I let the onion get started for a few minutes and then toss it in, because I find that garlic burns on the bottom of the pan easily). I’ve always been afraid of making risotto but this just looked so good and motivated me to give it a shot. Mine didn’t look quite as pretty as yours but it tasted amazing! I shared this recipe in a recent meal plan on my blog, thank you! I love your website!!! What a great resource! I cannot even tell you how much I ADORE this dish! 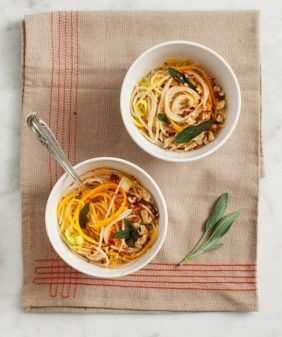 It’s like little Thanksgiving feast – so herbal and delicious with the squash. Can’t wait to whip this up again someday soon. 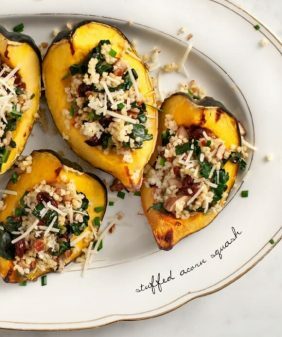 I adapted this tonight and used quinoa instead of risotto rice, I also added a handful of ground almonds (in place of pine nuts). Yummy! Just made this for dinner and me oh my was it delicious! Thank you, thank you, thank you! Risotto is my ultimate comfort food – and this recipe looks like it will hit the spot! Definitely trying it. Thanks! This looks amazing! I have always been intimidated by risotto but I think I’ll give it a try! Is the “signature seared scallop” recipe on this blog somewhere?! Hi Kara, let me know how it goes! Just finished this meal. Very good! Went well with the pumpkin beer I brewed this fall. Wife and son enjoyed it. I think it is the first rice dish our 2yr old has liked. 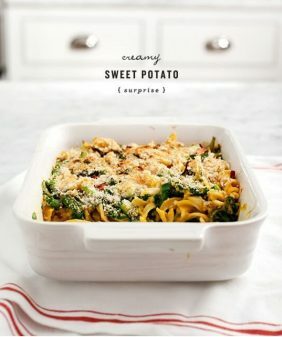 2 for 2 on the recipes I’ve tried from your site! Hi John – so glad you all liked it, thanks for sharing!! Beautiful blog! We made this dish last night, and while it didn’t look as pretty as the pictures, it was tasty! A little heavy on the sage for us though, next time I’ll reduce it by 1/2 and increase the butternut squash by at least twice. I love this recipe, and would love even more to use it in an article for a school project. I was wondering if you could answer a few questions about it for me. What is its nutritional value? also how much roughly would it cost to make per serve? do you have any tips about switching ingredients to meet dietary requirements of others? Also another thing would you please give me permission to use your photos in my article, they are so artistic and I would hate to try and photograph myself and not look as amazing. Just incase you were wondering this wont actually be published, it it purely for a school assessment. We just made this for dinner the other night and it was delicious! Such a great combo. We used frozen organic butternut squash cubes and they worked great. Also, bought your book yesterday – excited to read through!